incredible life & times of the artist Bob Dylan. 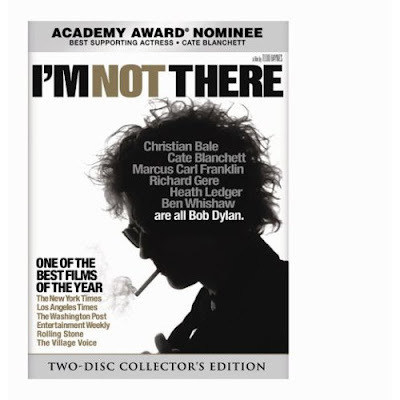 O.k, here's the short review: If ya 'get' Dylan, Ya get the movie. If ya don't... ya might just struggle to understand what the cotton-pickin' hells going on ! Actually, no. You cant just write a review about someone who is that important in musical/artistical terms by being too bloody flippant. Bob Dylan is without question (Obvious slight bias here-but what the hey-its 'my space' so to speak) one of the defining major artists in the last fifty years. What he has contributed is beyond doubt or reason or question. So, when the seed of an idea came to Todd Haynes' mind, the first (and absolutely right) decision he made was that whatever he did, it wasn't going to follow the usual bog-standard Biopic type formula. No, it was going to have to be like Dylan himself. Wild, unpredictable, engaging, mysterious, curious, entrancing, captivating, self-serving, opinionated, striving for a truth, and really, just about any other term/category that you could ever throw at Dylan. By taking this more unconventional approach, Haynes set himself up for producing something that could have been like some of Bob's worst work. Unlistenable, unwatchable, unlikeable, undecipherable. In short: Utter shite ! I started watching this movie after i finished an evening shift at my work, which after getting my self a nice hot cuppa, was about 11.15pm. So, after an pee break or 2 (bladders don't progressively get better with age-not for me anyways) i finished this movie about 1.30am the next morning. Why this trivial detail is important for me to impart upon you is a very roundabout way of saying that this masterpiece totally captivated me. I was, understandably bloody tired, but like a good book you can't put down, this was a movie i didn't want to end. Maybe Todd has got a sequel based on later-to current life partially 'sketched' out in his very fertile mind. Just maybe. OK. The next big thing was getting 6 different people to 'portray' Dylan at various stages of his life, or different aspects of his mercurial personality. I feel that this is the most crucial decision that Haynes had to make. Not only to make several unique facets for this character, but to get the actors who could best convey exactly what Haynes had in mind. The search/audition process would have been probably in turns fascinating and extremely frustrating as Haynes sought out the exact sensibilities that every actor has, and then how best to use use them for what he had envisaged. The choice of actors, as noted previously, was ultimately where this film's success-or failure was going to happen. Get the wrong actors, and it turns to custard. So many movies are dependant on the most impeccable casting choices. Usually, most directors get this spot on, but woe betide you if you don't. See my review of the John Wayne movie "The Conqueror" for startling proof of just how pear-shaped it can turn out ! And i gotta say that Haynes' picks were absolutely great-and very inspired. He could have got 6 crusty old white guys who would have been safe choices, but in line with his thinking on the whole project, why can't i use a young black kid, and hey! I'll use a female as well! that'll fox 'em! So, big Kudos to Cate Blanchett, Heath Ledger, Richard Gere, Marcus Carl Franklin, Ben Whishaw, Christian Bale for bringing their own individual talents to make their own 'Dylan' something completely separate from the other actors. The supporting cast is, er, well cast! I liked Bruce Greenwoods Journalist, charlotte Gainbourg's wife & Julianne Moores 'Joan Baez' characters. All each, very very good. The other two major aspects of this movie that stood out were the outstanding editing & use of Dylans (As well as inspired cover versions) music. Both facets were engaging & imaginatively used. Credit also to the costume/set dept's for creating the right vibe as well. The period detail was spot on.